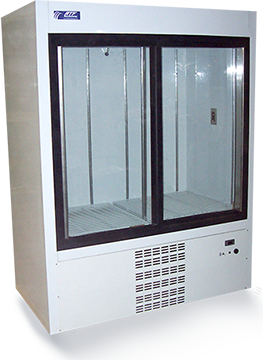 RTF Chromatography Refrigerators are designed for scientific, clinical, and industrial use. They will maintain a standard operating temperature of +4°C within +/-1°C. USDA white steel or stainless steel finishes. Microprocessor-based electronic temperature control adjustable from +1°C to +8°C. Heavy duty ozone-safe R-134 condensing unit. Adjustable stainless steel shelves on 1/2″ centers. Flourescent 40 W T-8 interior lighting. 6″ heavy duty casters with brakes. Design or specifications subject to change without notice. Stainless steel shelves instead of pull-out drawers.